Happy Birthday Author: Happy Birthday Tomie dePaola - September 15! Happy Birthday Tomie dePaola - September 15! I want to start off this week's blog encouraging you to visit Tomie dePaola's website - www.tomie.com. This website was not around when I was teaching and I wish it would have been because my students would have loved visiting it. There is a great biographical section under the "About Tomie" link. The "Resources" section is disappointing, but there is a great "Calendar". I remember researching Tomie dePaola and his books in preparation for this birthday celebration week when I was teaching in the classroom. It was an overwhelming task. Tomie dePaola has written and/or illustrated over 200 books for children. Therefore, "where do you start?" I knew needed to teach my student about folktales at some point in the year because of the academic content standards. I noticed that Tomie dePaola retold and illustrated many folktales and legends. So, I decided to introduce the terms folktale and legend to my students during this week. Then I had the challenge of deciding which books to read with them. I settled on Jamie O'Rourke and the Big Potato and The Legend of the Indian Paintbrush. In class we discussed that folktales and legends were stories that were orally passed down among people of a region through generations and eventually written down. Legends differentiated from folktales in that they were not necessarily true stories but were connected to real events. 1. Jamie O'Rourke was smart to take the potato seed over the pot of gold. 2. Jamie O'Rourke was a lazy man. 3. I would get sick of a food if I ate it every day. 4. It is acceptable to be lazy. 5. Jamie and Eileen will live happily ever after. I displayed these statements on the chalkboard, overheard, or on a computer with a projector and revealed them one at a time. The students were encouraged to read the statement, think to themselves and write down whether they agreed or disagreed with it and then why they felt that way. Having the students express themselves by describing why they felt a certain way prevented one word responses! After a few minutes of writing I asked for a show of hands for those who agreed and then those that disagreed. I then asked two students from either side to debate. As you can envision, this simple activity can lead to higher level thinking. I also first discussed the activity, Pre-Voc, during Brian Pinkney's Birthday Week. I loved using these short and simple activities for different books over and over again. The students immediately knew what is expected of them because the directions have been covered many times before. I found that when the activity was familiar the students could really focus on thinking about the story. Pre-Voc is an activity that is used before a story is read to get students exposed to the words that they will see in the book. I chose the following words from The Legend of the Indian Paintbrush: boys, tribe, warriors, Little Gopher, animal skin, brush, paint, remember, sunset, berries, pictures, dream-vision, colors, share, plants bloom. I displayed these words on the chalkboard and asked the students to write a prediction of what they thought the story is going to be about. We shared our ideas and then read the story. After the story, we discussed what was right and wrong about our prediction. It should be noted that I found that Tomie dePaola has written and/or illustrated many other folktale and legend books that include but are not limited to: The Legend of the Bluebonnet, The Legend of the Poinsettia, The Legend of the Persian Carpet, The Legend of the Old Befana, Jamie O'Rourke and the Pooka (sequel to The Big Potato), Tony's Bread: An Italian Folktale, The Mysterious Giant of Barletta: An Italian Folktale. As I continued my research of Tomie dePaola books I found that he had some great characters that had many books. The most notable being Strega Nona (8 books). There was also the Barker Twins (series) and Bill and Pete (3 books). 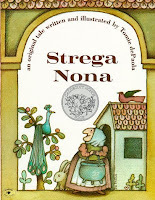 I selected Strega Nona because I felt she was the strongest character to have my students explore in more detail. I introduced the literary term, character, which many of them had heard before. I had them read a Strega Nona story and complete a character map. I found many character graphic organizers at Education Oasis. It is worth noting that the literary term, setting, could be introduced or reviewed because many character maps can include information about where a character lives and spends their time. Tomie dePaola has also written many autobiographical books. I was unable to find a place for them in my classroom lessons, but I informed parents of the titles. A few of my favorites are Nana Upstairs and Nana Downstairs, 26 Fairmount Avenue, Tom, On My Way: A 26 Fairmount Avenue Book, and The Art Lesson. As I look back it would have been a great time to introduce the term, autobiography.